Conserve water- Proper planning and design are key factors to helping you save water (by eliminating overuse) with your sprinkler, which is why professional installation is always recommended. Save time- It takes time to water your lawn with a hose, and if you forget or you are too busy, your lawn could suffer the consequences. Save money- While the initial investment may seem like a big one, many sprinkler systems eventually pay for themselves through the water that you save and the value that they can add to your property. Convenience- No more having to drag a heavy hose around or accidentally soaking your work clothes in the morning. Just set the timer and get on with your life. 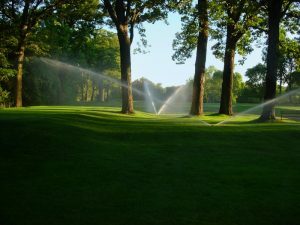 A beautiful lawn!- This is probably the biggest advantage of an automatic sprinkler system. Nothing keeps your lawn healthier or greener than proper irrigation. Don’t be intimidated by the initial price of sprinkler system installation, there are many great benefits and it could eventually pay for itself. At Advanced Landscaping and Sprinkler, we pride ourselves in providing the best landscaping service in Ft. Collins, and we offer great deals every single day. Right now is the perfect time to talk about your new automatic sprinkler system because you can take advantage of our money saving, early sign up discounts. Don’t wait, these discounts won’t last long! Call us today to get your free estimate.